this picture is from worcester, mass. I will be offline for a while. 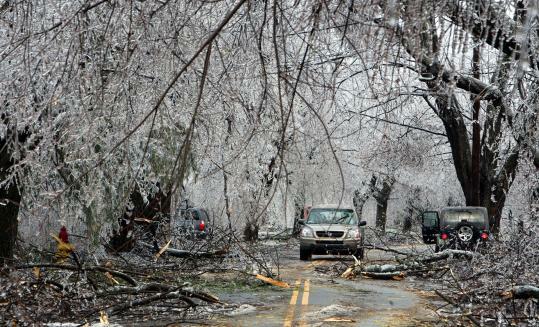 Ice has damaged my power and phone lines running to my house, and about 200k other NH residents are without power. This is historic. I will update this post with pictures of my yard. I can tell you in all honesty that I was scared during the night. Trees breaking and falling all around my house, I thought the house was going to get hit, or one of my cars destroyed. Luckily the damaged was limited to the power and phone lines. Ill keep you posted as I can. Re: Massive ICE STORM hits my area! its sunday, and my phone line is still seperated from my house and lying on the ground. phone line = internet as my connection is DSL. I hope for repairs early in this week.